Prepare for exams, check rides, and interviews! Questions for Parts 119, 121, and 135 operations. Flashcard Study Guides help to develop and maintain a solid core knowledge of the rules and regulations that are a part of a pilot's daily life. Designed to be easy to pack and carry, flashcards provide pertinent regulatory questions with detailed answers and references for further study. Updated to include the latest rules and operating procedures for airline operations. 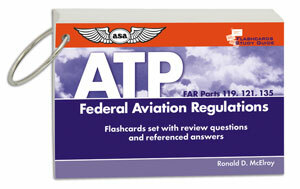 The Flashcards for ATP set provides 80 practice questions from 14 CFR Parts 119, 121, and 135. Written by airline pilot instructor and author, Ron McElroy, the cards are especially helpful for folks preparing for an ATP checkride or airline interview. Printed on heavy card stock in a 4''x 6'' format, shrink wrapped in clear plastic. A hole punched through the cards and a metal ring clip is included to keep the cards in order.